192 pages, 22 x 26.4 cm , 970 g.
For the first time in Switzerland, the Aargauer Kunsthaus devotes an extensive survey to this multi-talented cosmopolite. 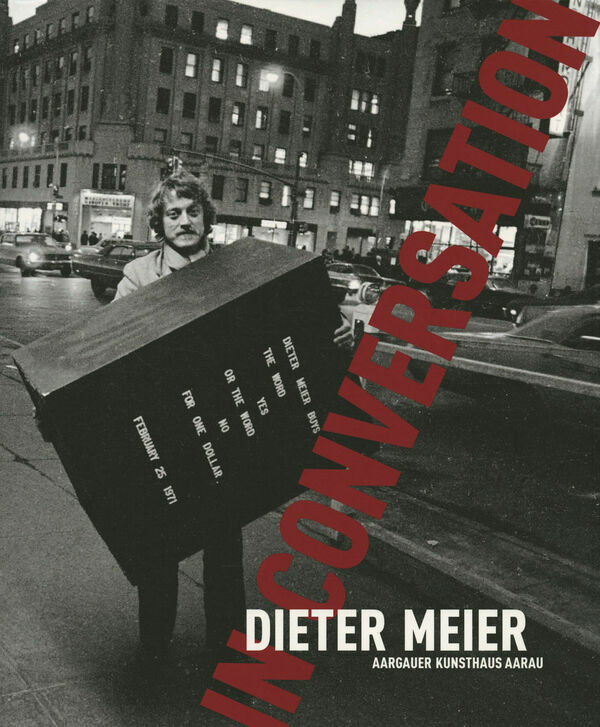 Titled “In Conversation”, the show covers Meier’s entire career from his performances and conceptual artwork of the 1960s and 1970s to the present, rendering the far-reaching significance of his output palpable by including works and documentations which, in some cases, will be on view here for the first time. The exhibition offers insights into the richness and critical potential of Dieter Meier’s early actions in public spaces, highlighting the consistency with which he continues to pursue his artistic objectives to this day. Starting from little-known early video pieces and photo series, the interconnectedness of these bodies of work becomes evident. Many of Dieter Meier’s early works would influence the famous video clips of the electronic pop duo YELLO that went down into international music history. Given the artistic significance of the YELLO video clips, these are presented in a gallery of their own. The catalog presents an extraordinary artist whose work keeps transgressing conventional boundaries between genres.